Rom-coms were once part and parcel with summer blockbusters, but over the past few years, there's been a decided lack of romantic comedies released — at least those that accurately capture love and its sometimes (OK, oftentimes) complicated attachments. Judd Apatow gets it. He knows that actual love can be funny, gross and painful. With that perspective in mind, he's given us some of the best rom-coms of the decade, including THE 40-YEAR-OLD VIRGIN, KNOCKED UP, THIS IS 40 and TRAINWRECK, his latest, which was released two years ago. We're long overdue for a new, "real love" story to bring back those warm and fuzzy, albeit uncomfortable, feelings. And we're getting it: Apatow has produced a gem of a film called THE BIG SICK, which has spent the first half of this year tearing up the festival circuit, including the Sundance Film Festival. While it's to be determined if it'll herald a sudden resurgence in romantic comedies, there is something punk rock and exciting about the way it repurposes a stagnant genre into a bold, unflinching look at the crazy entanglements that love sees fit to inflict upon us. If you're not planning on seeing this film during its summer-wide release, or think rom-coms are dead, here are some reasons to give love another chance. 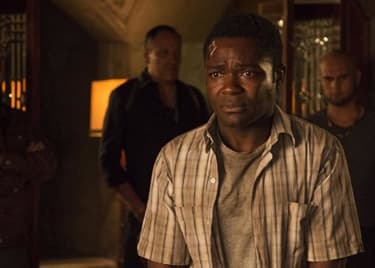 Before we even get started, you must know one thing about this film: It's based on the courtship of the film's writers, Kumail Nanjiani and Emily V. Gordon. Early in their relationship, Gordon had to be placed into a medically induced coma while Nanjiani waited by her side and grew closer to her family and loved ones. Today, the two are married and doing cool stuff, like writing movies together. The film fictionalizes some aspects of their story, but as outlandish as the plot may seem, it really happened to real people who really fell in love. This is THE BIG SICK's secret weapon. It subverts the romantic comedy genre by telling a real story instead of a fairy tale. As it turns out, messing with the previously established rules of romantic comedies pays off. Outside of Apatow's movies, the first film that comes to mind as an example is 2009's THE PROPOSAL. As a whole, it's very much entrenched in the rom-com fairy tale narrative, but shifting the gender/power ratio of its leads created an interesting approach that worked — the film grossed more than $317 million. More traditional films released in 2009, like HE'S JUST NOT THAT INTO YOU and THE UGLY TRUTH, didn't gross more than $181 million and $205 million, respectively, to give you perspective. It's ironic that the best way to make a decent romantic comedy is to be honest, which is exactly what happens in THE BIG SICK. It's a love story that could actually happen, because, well … it actually did happen. The moments that Emily (played by Zoe Kazan) and Nanjiani share on screen are few and far between, which enhances the scenes they do share. We're used to romantic comedies shoving the leads in our faces whenever possible, likely because they're both A-list actors and isn't that why you came to the movie in the first place? In THE BIG SICK, the love story develops thanks to Kumail and Emily's respective families, played by a phenomenal supporting cast (Anupam Kher, Zenobia Shroff, Ray Romano and Holly Hunter, to name a few). We get to experience the heart-pounding, early stages of the relationship between Kumail and Emily, but her inevitable coma — and their relationship status before said coma — sets a fascinating tone for the rest of the film. Like anyone who has seriously pondered what it means to be in love with another person, Kumail spends much of the film by himself, getting to know Emily's family while he figures out his relationship with his own. That's not to say that his scenes with Emily are downplayed or lack power — Nanjiani and Kazan have incredible on-screen chemistry together. After seeing their relationship develop during the film's first act, we desperately want to see more of them. The plot device of having one of the romantic leads in a coma for most of their screen time lets the film explore the reality of being in love. Even though he's hesitant to do so at first, Kumail takes a huge emotional risk by getting to know Emily's parents and becoming an unexpected part of their lives while she is in a coma. As nobody knows when or if she will wake up, Kumail's investment in taking care of her could completely blow up in his face. There has never been a romantic comedy in which the stakes are so high. A quick scroll through THE BIG SICK's cast and crew list tells us this film has a well-stocked arsenal of comedic talent bringing it to life. 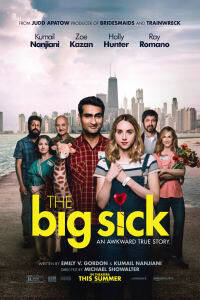 Nanjiani is one of the funniest comedians in the business, and THE BIG SICK lets him capitalize on his understated, geek-centric brand of humor while exploring the beautiful pathos of his predicament. Veteran comic Ray Romano offers an unexpected turn as Emily's father, his deadpan façade slowly peeling back to reveal the rocky path that his own love story has trod. Holly Hunter's ability to sharpen everyday words into deadly weapons is in full force here, and her scenes with Nanjiani are some of the film's best. Anupam Kher and Zenobia Shroff as Kumail's traditional parents — who insist on inviting eligible Pakistani bachelorettes over to the house every time their single son visits — could have very easily been written as one-dimensional meddlers; however, Kher and Shroff bring just the right amount of warmth and comedy to their characters, making us see them through the eyes of their son. The cast is spot on, but let's not overlook director Michael Showalter, who co-created WET HOT AMERICAN SUMMER and directed 2015's underrated comedy HELLO, MY NAME IS DORIS. He's the type of director who realizes that comedy and drama are more closely related than we expect, and he strikes a perfect balance between the two in THE BIG SICK. We love big-budget, CGI-fueled superhero movies as much as anyone, but we've been yearning for more movies about real people. THE BIG SICK happens to be a great movie about real people, so see it while you can. There's no telling when a chance like this will come around again. THE BIG SICK is in some U.S. AMC theaters now and opens wide on July 14.